The Leonardo Permanent Multipurpose Module (PMM) is a module of the International Space Station. It was flown into space aboard the Space Shuttle on STS-133 on 24 February 2011 and installed on 1 March. Leonardo is primarily used for storage of spares, supplies and waste on the ISS, which was until then stored in many different places within the space station. The Leonardo PMM was a Multi-Purpose Logistics Module (MPLM) before 2011, but was modified into its current configuration. It was formerly one of three MPLM used for bringing cargo to and from the ISS with the Space Shuttle. The module was named for Italian polymath Leonardo da Vinci. A European proposal suggested equipping the Donatello MPLM with enhanced micrometeoroid and orbital debris protection and cooling systems and leaving it attached to the ISS after the Space Shuttle fleet is retired. Costs for such MPLM modifications were estimated at $20M to $40M per unit. The MPLM would then be called a Permanent Multipurpose Module (PMM), and it would house spare parts and supplies, allowing longer times between resupply missions. The proposal was rejected by NASA because it would require changes to existing plans and would entail additional costs. Internal discussions continued and managers considered the possibility of STS-133, which at that time was planned to be the last Shuttle flight, leaving its MPLM permanently attached. The United Launch Alliance also published a proposal for a system that could allow additional ISS modules to be launched on an EELV even after the retirement of the Shuttle. On August 5, 2009 it was announced that STS-133 would indeed leave one MPLM permanently attached to the station. In October 2009, it was confirmed that Leonardo would be the MPLM converted to a PMM. It was launched on February 24, 2011. The PMM was transferred to the station using the Shuttle robotic arm and mated to the nadir (Earth) facing port of Unity. On May 27, 2015, at 13:08 UTC, the PMM was relocated from the nadir port of the Unity module to the forward-facing port of the Tranquility module. This was done in order to allow Unity's nadir port to serve as a berthing port for resupply craft, which in turn frees up Harmony's zenith port for future U.S. Commercial Crew Development spacecraft. PMM Leonardo at the Space Station Processing Facility (SSPF). After returning to Earth on April 20, 2010 at the end of the STS-131 mission, the Leonardo MPLM was moved to the Space Station Processing Facility (SSPF) at the Kennedy Space Center in Florida to undergo modifications. To convert the Leonardo MPLM into the PMM, NASA made the following modifications: removal of +Y grapple fixture (Flight Releasable Grapple Fixture, or FRGF), removal of ROFU (Remotely Operated Fluid Umbilical) components, replacement of CBM seal, installation of new forward end cone MMOD shields, feed through seal replacement, and installation of visiting vehicle retro-reflectors. In addition, the Multi-layer insulation (MLI) blankets from the never-flown Donatello MPLM were cannibalized for use on Leonardo. The blankets were removed and returned to Italy where they were reinforced with Nextel/Kevlar to provide better protection against micro-meteorites. The upgraded blankets were then installed on about two-thirds of Leonardo's surface area. The Leonardo PMM mass is 21,817 pounds (9,896 kg). 10 March 2001 – The Leonardo Multi Purpose Logistics Module rests in Discovery's payload bay in this view taken from the ISS by a crew member using a digital still camera during STS-102. The Leonardo MPLM, also known as MPLM-1, was one of three Multi-Purpose Logistics Modules which were operated by NASA to transfer supplies and equipment to and from the International Space Station. Leonardo was used for eight of the twelve MPLM flights to the space station, with Raffaello being used for the other four. 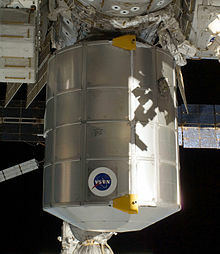 It was the first MPLM to be launched, making its first flight in March 2001, aboard Space Shuttle Discovery on STS-102. Following its last flight as an MPLM, on STS-131 in April 2010, it underwent conversion to become the Permanent Multipurpose Module, and was launched aboard Discovery on STS-133 to become a permanent component of the station. Like the other Multi-Purpose Logistics Modules, it was constructed by the Italian Space Agency, who chose to name it after Leonardo da Vinci. Construction began in April 1996, and the module was delivered to NASA at the Kennedy Space Center in August 1998 by an Airbus Beluga aircraft. STS-133 Discovery 24 February 2011 N/A Leonardo was left on-station to become the PMM. ^ Coppinger, Rob (2008-04-02). "NASA rejects European ISS logistics project". Flightglobal.com. Retrieved 2009-01-24. ^ Coppinger, Rob (2008-06-24). "NASA: MPLM may stay on orbit, docking rules to change and launch-on-need re-designated?". Flightglobal.com. Retrieved 2009-02-27. ^ Bergin, Chris (2009-05-05). "ISS considering the permanent attachment MPLM, advancement of STS-134". NASAspaceflight.com. ^ Foster, Mark. "System-of-Space Systems Architecture Utilizing Existing Space Assets to Complete and Re-Supply the International Space Station" (PDF). ^ Gebhardt, Chris (2009-08-05). "STS-133 refined to a five crew, one EVA mission – will leave MPLM on ISS". NASAspaceflight.com. ^ "Shuttle Q&A Part 5". NASASpaceflight.com. September 27, 2009. Retrieved October 14, 2009. ^ "Module Relocated Prepping Station for Commercial Crew | Space Station". blogs.nasa.gov. Retrieved 2015-05-27. ^ "STS-133 Press Kit" (PDF). NASA. Retrieved 4 December 2011. ^ a b "What is MPLM?". NASA Marshall Space Flight Center. Archived from the original on 27 May 2010. Retrieved 17 May 2010. ^ "Multi-Purpose Logistics Modules". International Space Station. NASA. Retrieved 17 May 2010. ^ McDowell, Jonathan. "Launch Log". Jonathan's Space Page. Retrieved 17 May 2010. This page was last edited on 14 November 2018, at 23:42 (UTC).